The Illinois Bicycle Lawyers at Keating Law Offices were recently retained to represent a Chicago bicycle messenger who was injured when she was doored by a passenger exiting a taxi near Union Station. On the evening of July 1, 2013, the bike messenger was riding her bicycle westbound on Adams Street just past the bridge over the Chicago River. At the same time, a taxi pulled over on the left side of Adams Street to drop off a passenger. As our client approached the taxi, a passenger suddenly opened the rear driver-side door directly into our client's lane of traffic, causing our client to slam into the door and fall to the ground. The passenger at fault immediately fled the scene before law enforcement arrived. "No person shall open the door of a vehicle on the side available to moving traffic unless and until it is reasonably safe to do so, and can be done without interfering with the movement of other traffic . . . ."
Under the Illinois Rules of the Road, the passenger is liable for our client's injuries, as he directly interfered with moving traffic when he opened his door into our client's path. Unfortunately, we are unable to seek recovery from this individual, as he fled the scene and his identity remains unknown. Fortunately, the cab driver and the company he works for are also liable for our client's injuries. City of Chicago Public Chauffeurs Rule 5.18 requires taxi drivers to discharge passengers "in a safe and legal manner" and requires divers to discharge passengers curbside. The driver is this case violated both of these requirements because the passenger opened the door in violation of Section 11-1407 of the Illinois Rules of the Road and because he failed to drop the passenger off curbside. 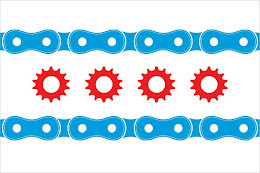 As such, the Illinois Bicycle Lawyers at Keating Law Offices are still able to seek recovery on our client's behalf. We are currently pursuing this claim against the taxi cab driver and the taxi cab company involved in this collision.